Well, let me start with this...I am still disappointed that I am not getting to do a triathlon this weekend but I have decided to use this as a learning experience. First off I am going to have a fantastic weekend away with my niece and I am going to use this to learn more about this sport that I have become obsessed with. I have enjoyed the training and I have found 2 other triathlons that might work to help me fulfill my goal of getting to do a triathlon in 2013! So now I am officially in rest mode. Yesterday my friend and I did a nice easy run/walk before work and then REST time started officially. I thought it was a pretty good run but it was just what I needed to keep my legs going but not tiring them out. I was kinda worried about my legs after bootcamp on Tuesday but I think they are finally recovered from that torture. Most of the run I tried to talk my friend into training to do the next triathlon with me. She has not committed to it yet but Im still working on it. I would do every single one of these with my niece but she will be back in school when the other two I have found roll around...but I bet I can get her in on some of these too. Today I got to sleep in, words that don't come along often, and not go to the gym. I missed the gym and my workout folks. You really don't realize how many of those people that are in your class become your friends. It was just out of the ordinary to not see them at 5am. But I skipped them gym and went straight to work. Rest time and race day anxiety don't really go well together because I have made list after list today and just needed to actually pack some things so I can release some of this anxiety. Now my biggest question is this, do I wear my tri suit since I am using this as more of a learning experience or do I wear my running clothes that I normally wear since I wont be swimming. I need to know how this suit will race but knowing that I wont get wet, should I wear it?!? I just don't know so I packed them both. I packed way to much but that's what I do! I hope that I have remembered everything but I know that they will have the expo the day before so hopefully if I forgot something they will have it there. And maybe I can get some triathlon stuff for when I actually do a triathlon! Now, no promises but I am going to try to take some pictures (I have kinda sucked at that all week) and I will try to update as soon as I can on Sunday to let you know how it goes. Oh and today I decided what my Phase 3 prizes will be if I hit my goals. The first one is not a huge surprise, if I hit the 30 pound goal I am going to give myself 3 months of Crossfit. 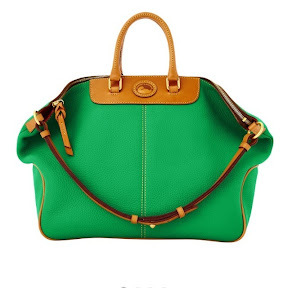 And if I hit my under 200 pounds goal I will give myself a new handbag. At work today this girl showed us a pic of a cute bag and it linked to another bag that was darling and way to expensive to just have. I was telling my sisters how cute it was at dinner and it hit me...something I would like to have but wouldn't buy for myself regularly. Perfect! Phase 3 big goal prize is the Dooney that is darling!!!!! Please don't go buy my bag cause I don't like mine to match others. The weight loss board has been updated and I cannot wait to get a new bag! There is a Wet Dog Trialthalon in Decatur at Point Mallard in a couple of weeks. I still love reading your blog.